I love a good steak taco on a fresh corn tortilla with guacamole and pico di gallo over the top. It’s so delicious and relatively simple to make. If you’ve never made your own corn tortillas, they are totally worth the effort, and they’re pretty easy to do. Just purchase a simple cast iron tortilla press for under $20, and you’ll suddenly find all sorts of reasons to make fresh corn tortillas. 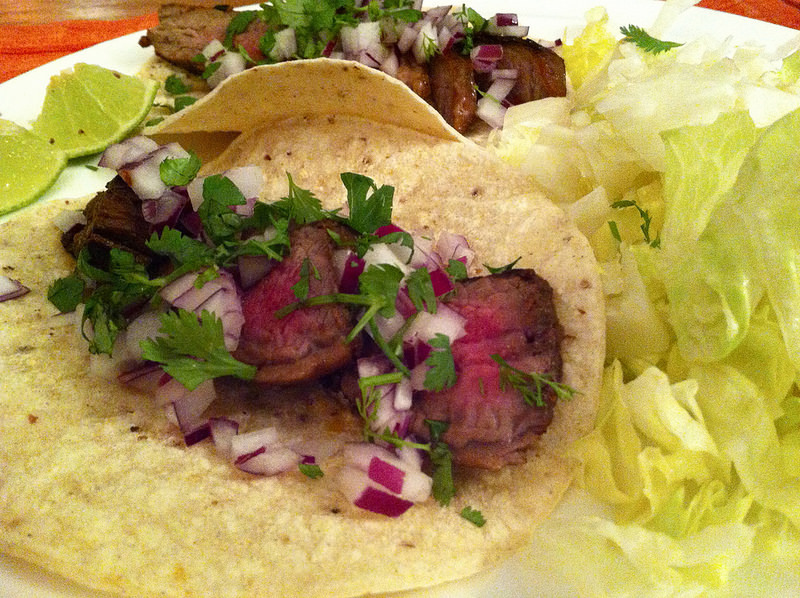 Note: Since we have started eating paleo, I still use the basic steak marinade recipe, but we skip the corn tortillas. Instead, we wrap the steak and guacamole in tender butter lettuce leaves for a delicious taco. Prick the flat iron steak with a fork several times on both sides and season it with salt and pepper. Put the flat iron steak in a large zipper bag. In the bowl of a food processor, combine the scallions, garlic, jalapeño, cilantro, salt, lime juice, and olive oil. Pulse the food processor for 10 to 20 one-second pulses, until the vegetables and herbs are finely chopped. Set aside one tablespoon of this mixture and refrigerate in a small container. Scrape the remaining herb mixture into the bag with the flat iron steak. Squeeze the bag to distribute the herb paste so it completely covers the steak. Refrigerate the steak and allow it to marinade for about three hours. When you’re ready to assemble the tacos, scrape the herb paste off of the steak and discard it. In a large sauté pan (I use cast iron) set on medium high, heat some olive oil until it shimmers. Add the steak and cook three to four minutes per side for medium rare. Set the cooked meat aside tented with foil while you prepare the tortillas and pico di gallo. Cut the meat on the bias into thin strips. Put the warm strips of meat in a bowl and toss with the reserved herb paste. To assemble, place the meat on the corn tortillas or lettuce leaves. Top with a dollop of guacamole and some pico di gallo. In a large bowl, mix all ingredients until the form a ball of dough. Separate the dough into 15 equal sized balls and cover them with a damp cloth. Working one ball at a time, press it on the tortilla press (or roll it out into a thin tortilla shape). Heat a cast iron pan over medium heat. Cook the tortillas one at a time, about three minutes per side until. Wrap the tortillas in a towel to keep them warm until you are ready to serve them.